The Left attacks the Right. Bastille Day, France's national holiday, commemorates the storming of the Bastille on 14 July 1789, which marked the beginning of the French Revolution. Left, right, conservative, liberal. We hear pundits using these terms everyday. TV commentators say the passage of the health care bill was a victory for the left. Now the right wants to appeal it. 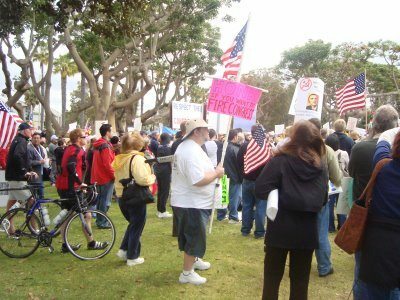 The Tea Party on the right, the anti-war movement of the left. Left versus right. Right versus left! What the hay!? Do you know what all this means? Since these terms are bandied about so much, at the same time it’s not clear everyone knows what they mean. So, I wanted to lay out a brief primer on what these terms are and where they came from. Politics is the exercise of power. And obviously, not everyone agrees how that power should be exercised, so different positions are developed; movements and politicians wrap themselves around those positions and fight it out – usually non-violently. 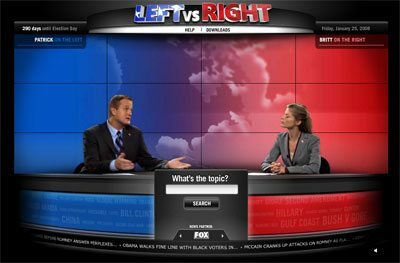 So, on a wide and lengthy political spectrum, the terms “left” and “right” are meant to convey positions that are in opposition. The origins of the terms come from the French Revolution of the late eighteenth century – as all of our modern political terminology and symbology does. That cataclysmic event, the revolt that overthrew the French king – beheaded him even – overthrew the aristocracy and the privileges of the church, came on the heels, of course, of the American Revolution. 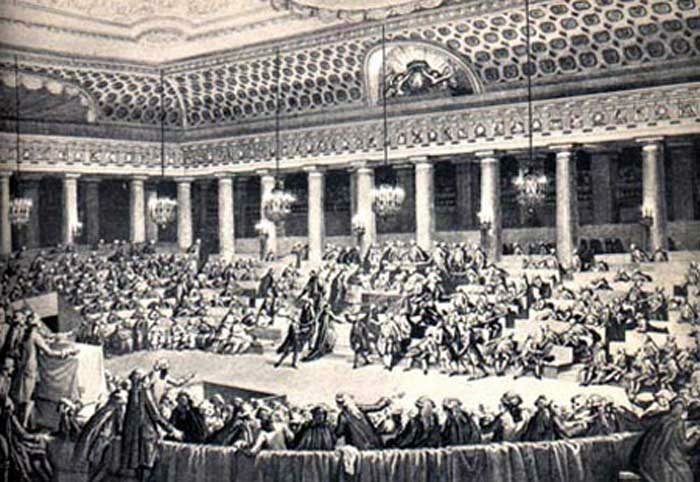 The National Assembly in France, 1789. During the early days of the French upheaval over two hundred years ago, all the legislators met in what was then the National Assembly. Those who sat on the right side of the huge chamber wanted to keep the king and the monarchy. In the middle you had those who wanted to work out some solution where the king was still part of the government. And those on the left side of the chamber wanted to remove the king, get rid of the aristocracy, enact universal (male) suffrage and redistribute the wealth. Hence, the terms “left” and “right”. The French right wanted the King to stay in power, and the French left wanted to behead him – or at least remove him. Usually those on the left want social egalitarianism and change, whereas those of the right want order and the status quo. “Left-wing” politics and “right-wing” politics were terms later developed by the political movements that engulfed France in its turmoil in the mid-1800s. Yet, ever since, pundits, politicians, political movements have claimed corners of the right or the left – or “the middle”. Left tends to be synonymous with “liberal” and right with “conservative.” Not always, though. Tea Party rally, October 2009, San Diego. It is all relative and “left” and “right” positions are changing all the time. For example, today’s revolutionary of the left can be tomorrow’s power-hungry politician of the right. Yesterday’s leftist idea can be today’s conservatism. And it can be confusing. The Tea Party is mainly on the Right but they want “change” by removing President Obama. At the same time they have resisted the change health care reform means. Back to our history lesson, many of the French revolutionaries overthrew the King – a leftist move – but then sided with Napoleon Bonaparte in setting up a dictatorship – a move to the right. Two centuries ago, European “leftists” were in support of laissez faire capitalism – they wanted to end the controls of the monarchy – , until there developed a left critique of capitalism, which indeed moved the barometer even more. Leftists were no longer in favor of the system. Left and right are also objective descriptions. Without being conscious about it, a person, a body, a movement can be objectively on either side of this great divide. 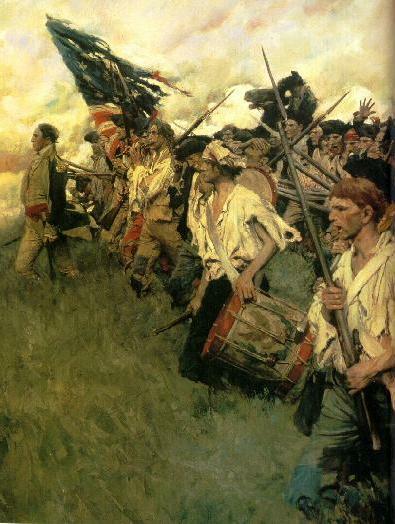 The terms were not around during the American Revolution of 1776, but there was still a “left” and “right” within the colonists battling the English King and then the Redcoats. The Tories – colonists who sided with the English – about a third of all those in the 13 colonies – were definitely on the Right. There were those who wanted to negotiate with the King and remain part of the British system. They were also on the Right. Then there were those who wanted to overthrow the British system in the Colonies and set up an independent nation. They were on the Left. Even though the American revolution kicked the British out, it was more of an anti-colonial war, in that the over-all system was preserved. 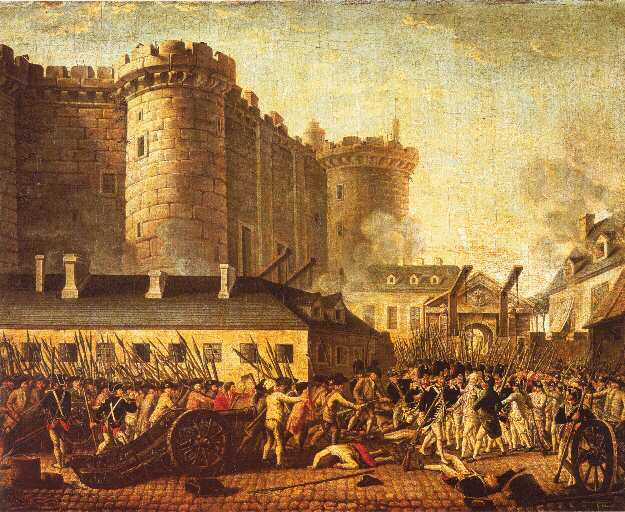 The French revolution actually overturned the then existing class structure and dethroned feudalism, so historians view it as more of a “true” revolution. 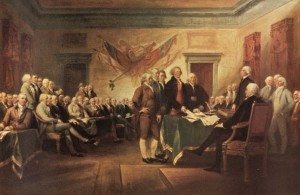 Back in America, after peace treaties were signed with the Brits, the former colonists went about setting up their new government and structure. Andrew Hamilton, once a “leftist” because he favored the war, moved to the “right” as he tried to install conservative ideas into the new framework. Thomas Jefferson, despite being a slave owner, continued his role on the left as he pressed for more and more universal suffrage and against an over-arching centralized government structure that was perceived to be top-heavy and destructive to the small farmer. His Declaration of Independence called for “life, liberty, and the pursuit of happiness.” Someone on the right would have written “life, liberty, and the pursuit of property,” a not-too-subtle distinction for the large colonial plantation owners and the rich northern merchants. The push for a written constitution was initially a leftist type maneuver – to get away from the English system. Once the Constitution was written however, people at the grassroots successfully forced the inclusion of amendments that guaranteed personal freedoms – the Bill of Rights. Those former colonialists who were against this were on the right. I’m just trying to show how the terms are relative, and mean different things in different historic contexts. Enough of the history lessons. What does all this mean for us today? Well, today’s political framework really is a result of the Sixties, when politics in America – and throughout the world really – became synonymous with change. Okay, more history, but at least it’s modern. The Sixties brought a new era of politics. Left-wing politics. The social upheavals of this country and all the industrialized countries profoundly changed their societies. Old realities and old definitions were no longer useful. As post-war capitalist countries were reaching their material zenith, the failures of their social structures became all too apparent – especially to the youth. We will continue this in our next session. Class dismissed … for now. Thanks for the schooling, I needed some refreshing! Good piece Frank. Sometimes it takes a little ‘hisstory’ refresher as a reality check. We wanted to renege on our war debt with the British after they saved our asses in the Seven Years War. Is that left or right? American land speculators didn’t want the British regulating land West of the Appalachians after the Royal Act of 1763. Is that left or right? Are we a country founded by liberal revolutionaries or debt scofflaws and real estate scoundrels? Nice article, Frank. I might add that left/right perception varies vastly by region as well as time period. For example, while we as progressives might view Obama as a left-leaning centrist and the conservatives in this country label him a left-wing extremist, virtually everyone in Europe sees his policies and ideas as being distinctly right-of-center. How about the Coffee Party vs the Tea Party? Should we call that left vs right, or is it really Freethinkers vs Religious Nut Jobs. If you took a poll off the Coffee Party, do you think the majority of them would favor mercy dying? Nice article to clear up some misconceptions. I am still confused as to why people compare Obama to Nazism. He is not encouraging Nationalism which I thought was some of the basis of the Nazi movement. Maybe he is encouaging a little Facism by forcing people to buy insurance from private vendors but all of this could be anothe article. I guess the real problem with a lot of this is so many people don’t understand the terms they are tossing around. It’s because the Nazis called themselves “National Socialist German Workers’ Party”, even thought they weren’t. I had one of these idiots insist that because Hitler called himself a socialist, so he HAD to be one. So if that’s true calling myself a supermodel will somehow make me tall and thin! And Hitler called them “National Socialists” to co-op the word “socialism” because it was so popular a concept after WWI. Dear reader: what questions would you want answered or explored in this series? Here’s a political grid consisting of 4 squares: Upper/Lower Left & Upper/Lower Right. Take the quiz at http://www.politicalcompass.org/index to see where you stand according to their calculations. perhaps a future poll??? this was fun and a pretty interesting questionnaire. I kind of came out where I expected . . . whew . . . thanks for the link, sunshine. Thanks Sunshine. I too took the test and it was fun. But the premise of the test is flawed. For instance, a totally controlled economy is NOT a leftist idea. Nor is Stalin on the “left.” So, it’s interesting to think in terms of 4 quadrants and not just two (left v right) but unless the basis for the testing is stable – and here it is not – it still leaves huge gaps. But again, fun nevertheless.